Are you afraid of buying a Vitamix because of the high cost? Then put away the fear factor and read my honest review of the Vitamix E310 Explorian Blender. Vitamix has introduced this high-performance blender without any of the “bells and whistles” of their other lines of blenders. This keeps the cost low enough to be affordable and competitive with other high-performance blenders in its class. The Vitamix E310 Explorian Blender is a recently introduced blender from Vitamix. Although it does not have things like SELF-DETECT™ Technology, pre-programmed settings, digital timers, or touch programmable timers, this blender does everything expected from a Vitamix blender. And it does it for $100s less. The Vitamix E310 Explorian Blender is powered by a 2.0 HP motor driving aircraft-grade, hardened stainless steel, 3″ diameter blades. This gives the blender plenty of power to pulverize even tough ingredients like hard vegetables, nuts, and dry grains. The friction of the rapidly spinning blades can make hot, steaming soup in less than 10 minutes without using a stove. The motor is overload protected to prevent overheating. 25 – 30 minute wait time after overload protection is employed before the motor can be restarted. The 48-ounce container is large enough for a small family (3-4 servings). Yet, small enough to fit under most kitchen cupboards fully assembled or in a cabinet. Although the container is not dishwasher-safe, thorough cleaning can be achieved by pouring 32-oz. of water with a drop of soap into the blender and running at high speed for 1-minute. Rinse clean. To sanitize dilute 16-oz. (473 ml) of vinegar in 16-oz (473ml) water and follow the same procedure as cleaning. The lid, lid plug, and tamper can be cleaned in the dishwasher. It comes with a small tamper used to process thicker mixtures and keep ingredients moving around and through the blades. The speed is continuously variable on a dial marked from 1 to 10 with 10 being the highest speed. There is one on-off switch and a pulse switch. Continuously variable speed means that you can precisely control the texture of ingredients. The pulse mode gives a burst of power for chopping ingredients, kneading dough and more. 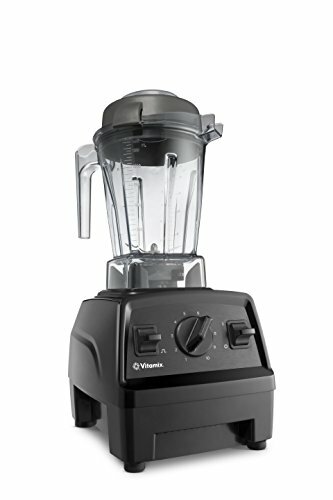 What Is The Vitamix E310 Explorian Blender Used For? Who Is The Vitamix E310 Explorian Blender For Or Not? Are you looking for a high-quality, high-performance Vitamix blender and willing to sacrifice some features to save $100 or more? Then the Vitamix E310 Explorian Blender is the one for you. Click on the image below to shop now on Amazon. However, if you are looking for something else, either more or less powerful or expensive, then click on the link to check out my Blenders page to find what you are looking for. There are lots of choices. The average Amazon customer rating is an outstanding 4.4 out of 5 stars. 85% of the ratings are 4 or 5 out of 5 stars. Fakespot discovered that over 80% of the Amazon reviews are high-quality giving them a Grade B rating. So, for those that want a less expensive Vitamix blender equal to ones costing $100 more but with fewer features, I give the Vitamix E310 Explorian Blender a 94 out of 100 and a highly recommended Buy. Learn more about other types and brands, read my blenders page. Do you have an opinion on the Vitamix E310 Explorian Blender based on your personal experience that you would like to share? I would love to hear from you. Please leave it in the comments box below. Or if you have any other comments or questions please leave them below. If you found this review helpful and informative, please like or share it. Just click on your favorite social media icon.